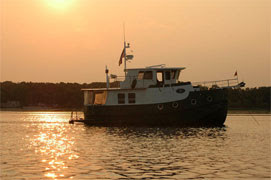 We arrived here on Thursday afternoon after a 5 hour cruise from Pawtuxet Cove in Cranston. We thought it was crowded, but they were able to put many more boats in here. I have never seen such boat handling at the dock, squeezing boats in and out all day long... amazing.